- New journal covers and related papers have been added. - PDFs of new manuscripts are available. - All genes in the ROS gene list are linked to TIGR and/or MIPS. - New microarray data has been added. Traditionally, abiotic stress conditions are studied in plants by applying a single stress condition such as drought, salinity or heat, and analyzing the different molecular aspects of plant acclimation. This type of analysis is, however, in sharp contrast to the conditions that occur in nature, in which crops and other plants are routinely subjected to a combination of different abiotic stresses. In contrast to the “single stress”-type studies practiced in many molecular biology labs around the world, yield loss studies using simultaneous stress exposure in different crops are well-documented in various agronomic and horticulture journals (Fig. 1; Summarized in Mittler 2006). In addition, tolerance to a combination of two different abiotic stresses is a well-known breeding target in corn and other crops. Because the majority of molecular studies, performed under controlled conditions in the laboratory, do not reflect the actual conditions that occur in the field (i.e. stress combination), a considerable gap is likely to exist between the knowledge gained by these studies and the knowledge required to develop plants and crops with enhanced tolerance to field conditions. This gap might explain why many of the transgenic plants with enhance tolerance to a particular biotic or abiotic stress condition, developed in the laboratory, have failed to show enhanced tolerance when tested in the field. A focus on molecular, physiological and metabolic aspects of stress combination is vital to bridge this gap and facilitate the development of crops and plants with enhanced tolerance to field stress conditions. Fig. 1. THE STRESS MATRIX: A summary of agriculturally-important stress combinations and their effects (‘The Stress Matrix’). Different combinations of biotic and abiotic stresses are presented in the form of a matrix to demonstrate potential interactions. Different interactions are color coded to indicate potential negative [i.e. enhanced damage or lethality owing to the stress combination (purple)] or potential positive [i.e. 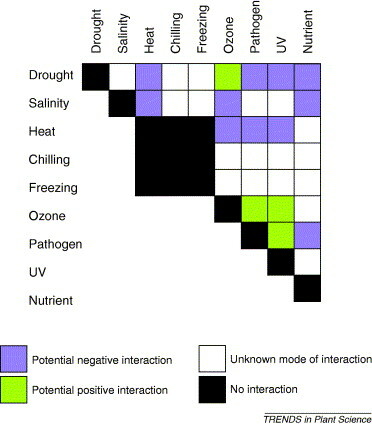 cross-protection owing to the stress combination (green)], effects of the stress combination on plant health. The potential effects of stress combination could however vary depending on the relative level of each of the different stresses combined (e.g. acute versus low) and the type of plant or pathogen involved (summary of 26 different papers from agronomic and horticulture journals cited in Mittler, 2006; 4). 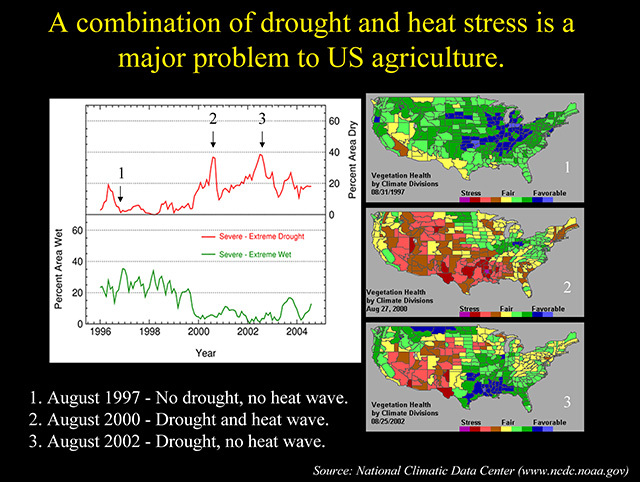 As can be seen in the composite figure below, plant health is drastically reduced during conditions of drought and heat. Copyright © 2011-2012 Ron Mittler Lab, Vladimir Shulaev Lab at UNT.